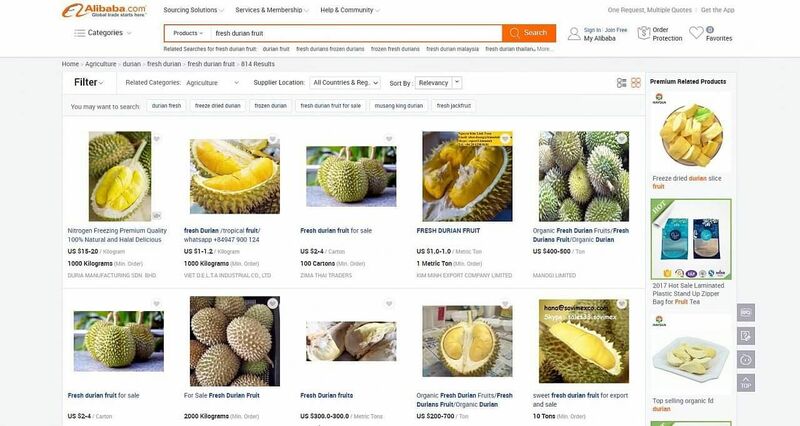 BANGKOK (THE NATION/ASIA NEWS NETWORK) - Thai durians sold like hot cakes in Thailand after Jack Ma showed the magic of e-commerce during his visit by selling 80,000 golden pillow durians on his online platform T-mall within one minute. While Mr Ma was in Thailand to make a mega-deal on investment on Thursday (April 19), Commerce Minister Sontirat Sontijirawong gifted the founder of China's e-commerce giant Alibaba Group a fresh "golden pillow", Thailand's most famous variety of durian. Mr Ma said at a press interview in Bangkok on Thursday that during the pre-order two days before the launch, there were over 60,000 orders and immediately 40,000 durians were sold. The number rose to 80,000 within a minute. The popular "golden pillow" durian has been sold on Alibaba's online supermarket since Wednesday, a day before Mr Ma signed four memoranda of understanding with the Thai government on trade, investment, support for e-commerce and tourism. Alibaba is reportedly splashing about US$330 million in Thailand, as it aims to tap Chinese consumers' appetite for the South-east nation's agricultural goods and its tourism market. At the ceremony, Alibaba and the Thai Commerce Ministry launched the first official Thai rice flagship store on T-mall, the world's largest third-party platform for brands and retailers, besides driving the sale of popular Thai fruits into China. Alibaba also pledged to assist Thai agriculture businesses in harnessing the power of the company's insights into the Chinese market. "China is on its way to becoming the world's largest consumer, driven by rising income and a growing middle class of 300 million. There is no better time than now for trade-oriented countries to seize this opportunity to export to China as the country continues to open its doors wider for global trade," said Mr Ma. Mr Ma has been to Thailand several times and in 2016, he also met Prime Minister Prayut Chan-o-cha during the G20 summit in China's Hangzhou city. Mr Prayut said he personally asked Mr Ma to help promote Thai agricultural products, particularly palm oil, rice and para rubber as well as cooperatives, community enterprises and modern farming using digital and related technologies and Alibaba's expertise in e-commerce and related fields.